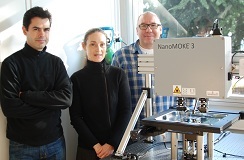 A NanoMOKE3 system configured for wafer mapping has been successfully installed in the Spintec laboratory of the CEA in Grenoble, France. Spintec are world leaders in spintronic devices and founded Europe’s best known MRAM company, Crocus Technologies. The NanoMOKE3 wafer mapper can accept wafers up to 200mm in diameter and automatically measure magnetic properties across the entire wafer surface with unprecedented sensitivity.